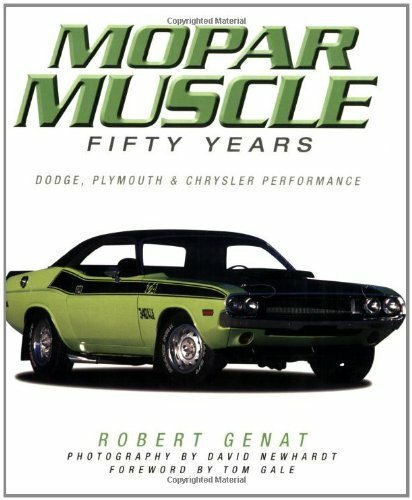 Product Description: Now in paperback, this book covers Chrysler's incredible series of muscle cars. In 1955 Chrysler introduced the first of its famed 300 "letter series" cars. The company designed a stylish, sporty car, stuffed in one of its potent Hemi engines, and gave birth to the American muscle car. The C-300's combination of style and performance put the Mopar brand ahead of its competitors in the postwar performance race. When the Detroit performance wars began in earnest during the 1960s, Chrysler was well positioned to build the most outragous, bodacious cars of an outrageous, bodacious era, cars like the famed Charger, Hemi Cuda, Road Runner, Superbird, and Challenger T/A. These cars dominated the dragstrips as well as the NASCAR ovals, and with color combinations guaranteed to burn out the corneas of your eyes if you stared at them directly, they ruled the streets of America; they ruled not just the streets, bu the drive ins and parking lots. Nothing was cooler than Mopar muscle. Over the years these legendary Mopar muscle cars were the fastest, baddest assed, most outrageous machines to rip up American pavement.